What is the biggest online shopping day of the year? Your first guess might be Cyber Monday, the day where people shop online from work to cash in on deals they missed over the Black Friday weekend. It’s not a bad guess. Last year, online retailers raked in about $6.59 billion on Cyber Monday. Your second guess is likely Amazon’s Prime Day event. Prime Day has become quite a spectacle for Amazon, and this year the company reported sales of roughly $4 billion for the 24-hour event. 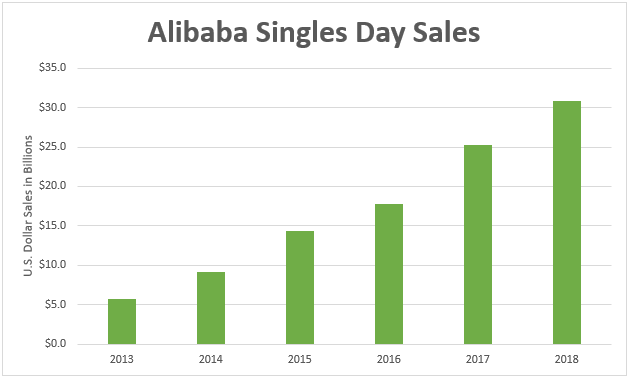 But the biggest online shopping day of the year is Alibaba’s Singles’ Day. It’s not an American event. It’s a Chinese holiday where people celebrate their pride in being single. It takes place on November 11 (11/11), which was chosen because of the repetitive use of the number 1, which signifies being alone. It’s a kind of anti-Valentine’s Day. A celebration of being alone doesn’t sound like it would be much of a shopping event. And it wasn’t, until 2009 when the holiday was transformed into a shopping extravaganza. Now, Chinese online retailers rake in billions as consumers splurge to snap up once-a-year deals on their favorite electronics and other must-have goodies. 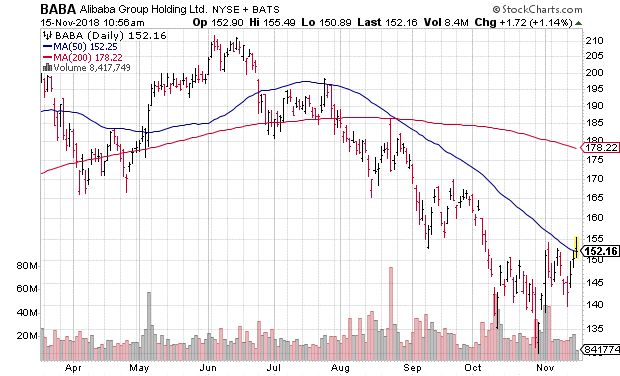 But one Chinese retailer tops them all: Alibaba Group Holding Ltd. (NYSE: BABA). Just How Big Is Alibaba’s Singles’ Day? Last year, Alibaba’s Singles’ Day sales topped $25.3 billion. This year, the company said Singles’ Day sales rose 27% to $30.8 billion. To put that in perspective, Black Friday sales hit a mere $7.9 billion in 2017. Even if you combine Black Friday and Cyber Monday, you still come up with only $14.49 billion in sales. 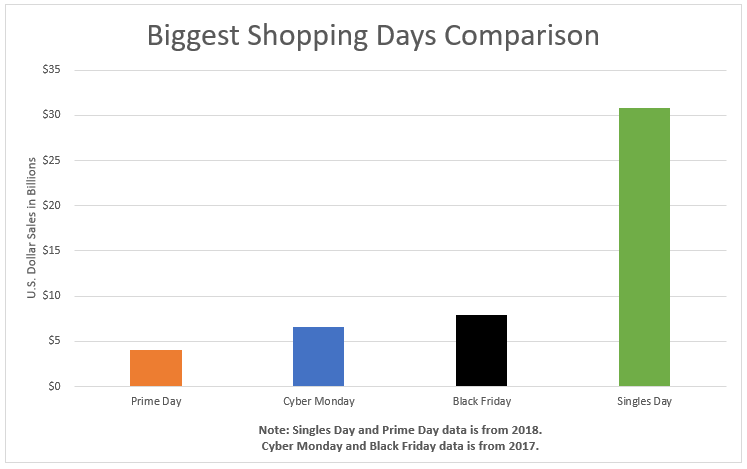 Alibaba’s Singles’ Day was twice as big as Black Friday/Cyber Monday, and nearly seven times as big as Amazon’s Prime Day. While Alibaba received a fair amount of praise for its Singles Day sales record, growth wasn’t as robust as many on Wall Street had hoped for. Analysts were roughly expecting a 32% jump in sales year over year, slightly better than the 27% growth reported. And it’s not just Alibaba. China’s economic growth is slowing. In the third quarter, China reported economic growth of 6.5%, down from 6.7% in the same quarter last year. While this easily tops the U.S.’ current growth rate of 3.5%, investors are concerned that the current trade war with the U.S. could further slow China’s growth. It’s a valid concern, but it’s one that has been greatly over-exaggerated. For one, China has a thriving and growing middle class — one that has money and likes to spend it. For another, the U.S. isn’t the only other economy in the world. China is expanding globally, and while the U.S. is making things difficult, that expansion will continue in the EU, India, Russia and elsewhere. This is why Alibaba saw revenue growth of 44% in the final quarter of 2018, and why it is projected to see growth of 51.4% next year. For investors worried about valuation, Alibaba’s price-to-earnings ratio rests at a mere 45.5 compared to the industry average of 56.5. In short, Alibaba stock is a bargain right now. Looking at BABA’s technical price action, you can see the stock has struggled with resistance at its declining 50-day moving average since July. The shares are currently hovering around the $150 area. There are two buy signals you want to look for when it comes to investing in BABA stock. The first is a pullback to the $130-$140 range. Support is strong there, and the shares have shown buoyancy in the area. The second buy signal would be a breakout and hold above the 50-day moving average and the $155 area. The shares are pushing for such a breakout this week, and if buying support remains strong, BABA could continue to move higher from here. Which buying option you choose should depend on your risk tolerance. But with Alibaba continuing to show strong growth even amid U.S. tariffs, the investment is sure to pay off in the long run.